Silicon Valley/Bay Area Business Coach Margaret Jackson and Radio Host of AM 1220 KDOW Money 2.0 Business on the Edge show has opened it’s CLUB doors nationwide. It is a united effort to support one's success. I/we plan to help women succeed, at each level, and if I/we can achieve that then it's a good day. 1. Premium Membership: Business on the Edge (BOTE), affiliated trainers, mentors, and coaches support the other membership levels through monthly leadership calls, webinars, training events, and network pitches. 2. Business Owner Membership: Micro-businesses that need customized support and a little more hand holding. The goal is to assist in supporting a sustainable business model, promotional opportunities, long-term business growth, and possibly becoming a BOTE affiliated training, . 4. Junior Membership: Ages 12-22 can be a junior member. The junior members are mentored by the top three levels of club members. Junior members can become junior leaders, and be given opportunities to speak to their peer groups with Business Coach Margaret Jackson, and other premium leaders. The club was officially launched in Silicon Valley/Bay Area in early February 14. The On the Edge Women In Business Club is a business & leadership training and networking support organization, a media resource hub, with a benefits and rewards structure that encourages constant steps toward reaching business, professional, and educational goals. Registration for membership is at On the Edge Women In Business CLUB. "I have been with Business on the Edge since I was 18, and I can't express enough how much I have gained personally and professionally from my experience. I am excited for this new Women in Business Club, so I can begin to network on a larger scale, better enhance my skills, and lead other members in business. I recommend this club to all who want to take the next steps towards success." (Veena Bhatia, 20, WIB CLUB Junior Member Leader, DeAnza College Student, California). 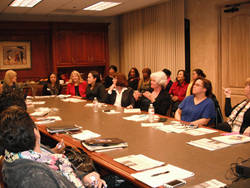 Business on the Edge is a San Jose / Silicon Valley leader in encouraging, motivating, and providing resources, tools, small business training and development for small businesses and women in business. It has a mass-media reach that supports small businesses and professional visibility through AM 1220 KDOW Business & Finance Radio and the online publication San Jose Women’s Business Examiner. For more information about Business on the Edge, Inc. visit its website at http://www.businessontheedge.biz.